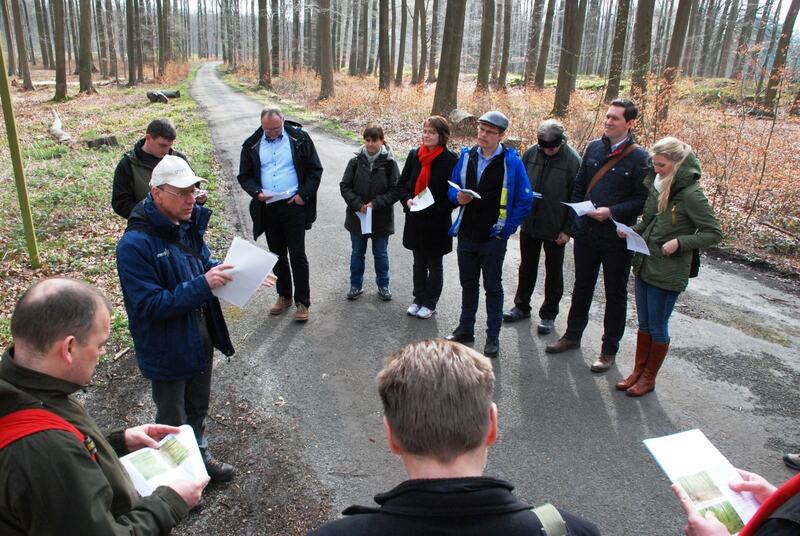 On 6 April 2016, EUSTAFOR and its Flemish member Natuurinvest organized an excursion to the Sonian forest. More than forty participants were picked up by bus from at the European Forestry House and, within minutes, found themselves in the forest located next to the city of Brussels. Tom Embo, Director of Natuurinvest, introduced his organization and Patrick Huvenne, Forest Manager, gave a presentation about the special features of this forest, which suffers from fragmentation. The fragmentation caused by the transportation structure is clear to visitors due to the continuous heavy traffic on the “ring” which cuts through the forest. What is less obvious is that the 4 400 ha large Sonian Forest is managed by no less than three different organizations. The forest is situated at the intersection of the Flemish, Brussels-Capital and the French-speaking Walloon Regions and even has some contiguous tracts of privately held forest belonging to the Royal Trust. But whether they call it Forêt de Soignes or Zoniënwoud, the Belgian foresters have committed themselves to working together extensively, creating a heterogeneous recreational infrastructure for the enjoyment of all. Mr. Huvenne’s presentation focused on Natura 2000, ecological defragmentation projects, forest management plans and the reorganization of the forest’s recreation plans. During the excursion, forest management planning, including different maps, were shown and the growth and regeneration of and risks faced by Sonian beech forests were discussed. Individual trees with a circumference of bigger than 250 cm are mapped. Some of the very big beech trees originate from an enormous afforestation campaign undertaken by the Austrian landscape architect, Joachim Zinner, more than 200 years ago. Another special feature of the Sonian Forest is the existence of areas whose soil has remained undisturbed since the ice age. Among other aspects of SFM, professional training for chainsaw operators was presented. The participants received explanations about the complex logging processes and techniques as well as how important it is for loggers to receive proper professional training. Natuurinvest participated in a project to define and maintain minimum standards in outdoor professions like forestry which can be applied in all European countries. One result of the project is the European Chainsaw Certificate (ECC) which is based on standards that were defined by the European Forestry and Environmental Skills Council (EFESC) to increase the health, safety and mobility of chainsaw operators throughout Europe (www.europeanchainsaw.eu). Participants visited the “Groenendaal Marteloscope,” a 1 ha sample plot where thinning operations can be simulated by means of an electronic tool. The economic and ecological value of each tree is estimated. Foresters are then able to make tree selections and verify the different (virtual) economic, ecological and structural outcomes if the trees they selected were to be harvested. The marteloscope is part of a European network of demonstration sites for the integration of biodiversity conservation into forest management (field guide). 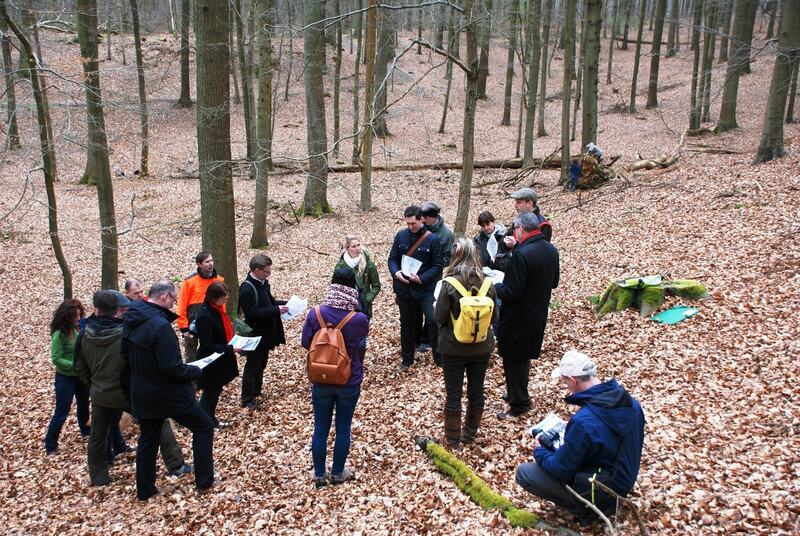 Faced with a diverse group of visitors composed of everything from expert foresters to neophyte non-foresters, the hospitality and perfect organization of EUSTAFOR’s Flanders member, Natuurinvest, was successful in providing a very lively and informative learning opportunity for all. The excursion ended in Kasteel Groenendaal, where a delicious meal of venison was provided by the Polish State Forests. Presentation "SONIAN FOREST - Structural vision - Management plan"